Koh Phangan is a small island located in the Gulf of Thailand in between the family resort-style island of Koh Samui and the popular budget SCUBA dive island of Koh Tao. It’s well-known among young travelers for the monthly Full Moon Party – most tourists show up a couple days before the party and leave as soon as their hangover fades for the next Southeast Asian backpackers destination – but what many people do not know about Koh Phangan is its amazing variety of recreational activities such as accessible waterfalls, beautiful beaches, epic parties, SCUBA diving at Sail Rock, and its blossoming yoga community. That’s right – nature, parties, and yoga – everything a traveler may desire, all on one small island! In recent years, there has been a growing conscious community, similar to Bali’s Ubud, in the small beachside village of Sri Thanu on the island’s western coast. 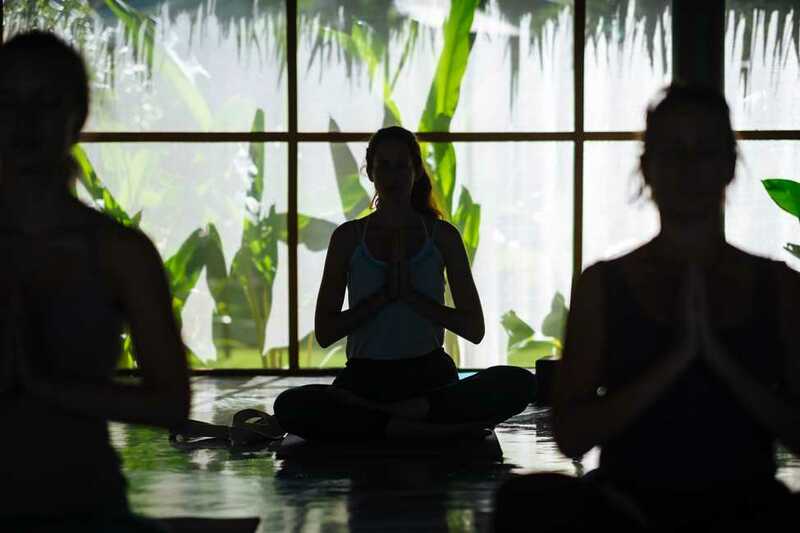 From chakra balancing to CranioSacral therapy, Tantra workshops to sound healing sessions, and Ashtanga Vinyasa yoga to handstand workshops – this area has it all when it comes to healthy living and healing. This tropical travel destination is still small and cozy, so it is a secret worth sharing for those interesting in studying yoga in a quiet and comfortable environment. Bali is the most famous Indonesian tourist destination in the world’s largest archipelago. In one year, approximately 3.76 million foreign tourists visit idyllic Bali – which has a local population of 4.2 million in its 5,780 km². 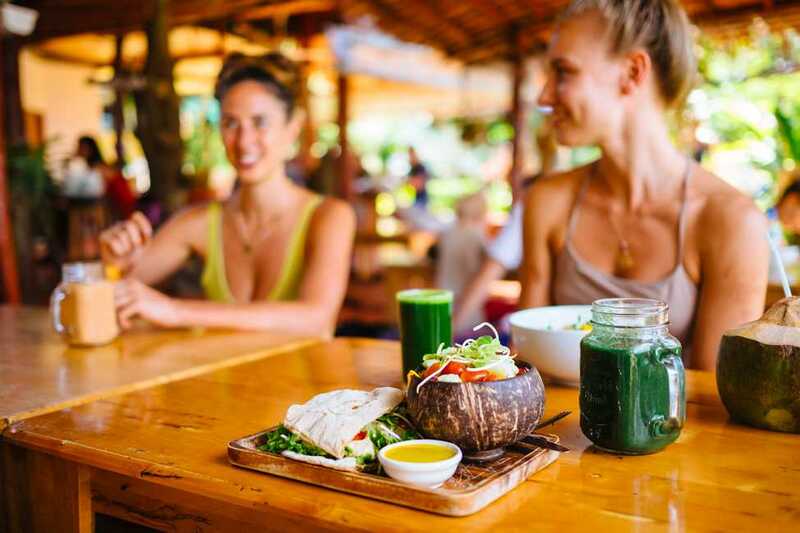 Popular for its arts and culture, and catering to the growing tourists interested in healthy food and conscious living, the town of Ubud has approximately 30,000 people and more than ten yoga studios. Since the memoir by American author Elizabeth Gilbert was popularized by Julia Roberts and Javier Bardem starring in the film adaptation, Eat Pray Love (2010), many spiritual tourists headed to Bali looking for their own healing and romance. This mass influx of tourists spiked prices and demand in the tourist industry, resulting in the inevitable shift from a paradise island village into an overrun tourist grinder. The noise pollution and chaos of tourists and traffic on Bali are the primary complaints of many tourists traveling in search of rest and rejuvenation. 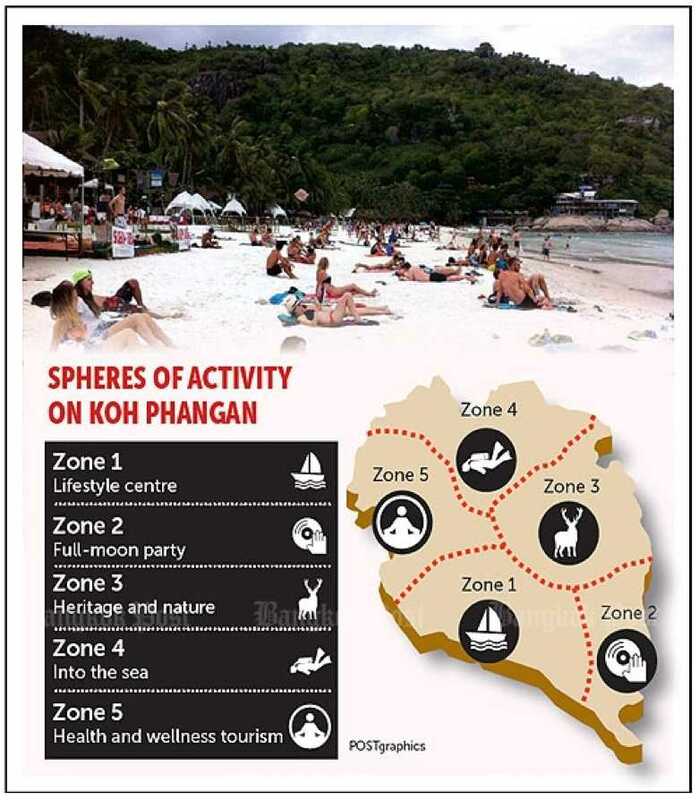 Despite its infamous Full Moon party at Haad Rin beach on the south-eastern tip of Koh Phangan, the island is relatively quiet still. Much less developed than its neighbor, Koh Samui, and with less dangerous hills to drive than Koh Tao – Ko Pha Ngan is one of the Gulf of Thailand’s best-kept secrets. This Thai delight has a population of approximately 13,000 people, and many unpaved jungle areas on the 125 km² island. Though 10,000 – 30,000 tourists per month come and go in the few days surrounding the full moon, it is believed that only 100,000 tourists annually spend more than a week on the island. With smaller yoga class sizes at the same price, and teachers of equal quality, many Bali-goers have said goodbye to Indonesia and hello to Thailand – the “Land of Smiles” – in an attempt to find a tranquil place for practice and personal growth. A much quieter place to study yoga, the village of Sri Thanu also has around ten yoga studios which provide a wide variety of daily classes with similar prices to Ubud, yoga teacher training courses, workshops, and yoga study programs longer than one month – which encourages people to stay longer and go deeper with their practice, as well as creating a connected community which is less transient and more stabilized. The breathtaking scenery of Bali is well-known, but many tourists receive a shock when they arrive and try to navigate their way around the island. Between the sheer number of other drivers on the road, taxis and inexperienced or inebriated scooter drivers, and (corrupt) traffic police – many tourists decide they don’t feel safe or comfortable enough to rent a motorbike and explore the island by themselves. Even experienced drivers complain about the confusion of Bali’s traffic signs, other reckless drivers causing accidents, the stressful experience of sightseeing adventures, and the exposure to airborne pollutants on the road. Motorcycle/scooter/motorbike rental companies in both Thailand and Indonesia will ask for cash and a deposit (or your passport as collateral) and seem to have very little interest in driving licenses or permits, or your level of experience. But to legally ride a motorbike, and to be covered by most insurance companies in case of an accident, the law requires you to have a motorcycle driver’s license from your home country, an international driving permit or license, and a helmet. These are highly recommended but not strictly enforced, except by traffic police who will often fine you whatever they decide. Driving a motorbike is relatively safe on Koh Phangan. Some hills, sand, and other drivers are the biggest dangers on the road, but navigating your way around the island is pretty simple due to clearly-marked and easy to traverse main roads. Unlike the chaos of taxis, scooters, and confusing streets to navigate on Bali, getting around Koh Phangan is comparatively simple. The coastal road from the Thong Sala pier – where most people arrive by ferry from other islands or mainland Thailand – running north to Sri Thanu is relatively flat, and very beautiful, especially for sunset views. More busy in the southern party zone of Baan Tai and Baan Kai, driving requires experience, sobriety, and the capacity for situational awareness – but there is only one main, flat road which makes getting lost nearly impossible. Driving by motorbike to Haad Rin involves some steep hills, but the beach is beautiful when the Full Moon party-goers have vacated. There is an amazing new “highway” which guides riders through enveloping Thai jungles to waterfalls and small beaches with deep water on the east coast of the island. It’s possible to drive via scooter on day trips to see all the popular (and more secretive) sights on the island, and still return home to your own bed – much more comfortable to drive, and more easily-accessible than Bali’s scenic areas. “Bali has a rich assortment of beaches, each of which is a favorite destination on its own. Bali beaches range from palm-fringed white sand coasts on the island’s south such as Kuta, Nusa Dua and Sanur, to the cliff-guarded ‘hidden’ shores of Uluwatu, Padang Padang, Dreamland and Bingin. Though popular for surfers and short holiday-goers, Bali’s beaches tend to be a bit overcrowded and overrated. Many of the island’s assortment of beaches have sprouted up resorts and hotels, and a trip to the beach can result in a headache getting through traffic unless you pay the hefty price for accommodation on the beach. Either way, Bali’s beaches are often not the picturesque and relaxing holiday vacation most people dream of. The island of Koh Phangan also boasts beautiful beaches, and because they are often less crowded and cleaner, many travelers are factoring this in to their beach holiday or tropical travel plans. Most of Koh Phangan’s beaches can be reached by motorbike, though some of the quieter and more secluded beaches are not connected by road and must be accessed by boat or a short hike. All the beaches on the west side of the island host sandy sunbathing beaches with shallow turquoise water, where you will see many healers practicing Watsu – a water massage, body healing therapy – in the warm water. The west coast is the spiritual tourist destination with a plethora of yoga schools, healing centers, conscious community events, and vegetarian/vegan/raw food restaurants. Srithanu village brags exquisite sunsets and views of the 42-island archipelago of Anthong National Marine Park, which was the inspired setting for English author, Alex Garland’s, travel/backpacking novel about off-grid community life on an undeveloped island in the marine park – The Beach (1996) – which increased in fame in 2000 because of the film adaptation starring Leonardo DiCaprio. There are regular day trips to the Ang Thong National Marine Park from Koh Phangan for nature lovers. Beaches on the east coast have deeper water, bigger waves, and a wilder feel among tall jungle trees and huge boulders. Even quieter because most beaches are only accessible by boat taxis or a short jungle hike (1-3 hours), these beaches are perfect for swimming or having a beach all to yourself. Nightlife flows onto the beaches in the south, and many restaurants and bars have modern beachfront locations and food from all over the world, and the north end is an attractive coastal community composed mostly of expats, SCUBA divers, and snorkelers. The island is the home of a wide variety of beautiful beaches for any interest, and besides Haad Rin during the Full Moon Party, most are undisturbed and peaceful – easy to find a tanning place all to yourself! Many yoga teachers have added Thailand to their world travel destinations, so highly skilled and experienced teachers are as easily accessible on Koh Phangan as Bali, and in addition to class sizes being smaller and more intimate, the prices seem to be nearly the same. Renting a house in Ubud ranges from nice houses without pools from $250-450 per month, and with pools starting around $580 a month. On Koh Phangan, you can rent a beachfront one-bedroom house with a kitchen and A/C in the bedroom for as little as $400 per month. A wooden, Thai-style bungalow in the jungle with a fan ranges from $200-$300 monthly. Villas with pools and larger, family-style houses also seem to have comparable prices on both Bali and Koh Phangan, and are often much more isolated, with fewer neighbors. Cost of food is also similar, with a healthy vegetarian or vegan meal at a restaurant catered for Westerners averaging $5-$10 on both islands, though Bali seems to offer more upscale dining options. Renting a motorbike is also about the same, averaging $60-$100 per month, or around $5 per day for short-term rentals. Yoga rates are surprisingly similar on both Bali (Ubud) and Koh Phangan (Srithanu), with competitive prices from drop-in classes to yoga teacher trainings. But the classes and courses are significantly smaller with less students on Koh Phangan, which promotes individual attention and creates a more personal relationship with the yoga teachers. The atmosphere in Srithanu is relaxed and easygoing – much less busy and hectic than Ubud – allowing students to casually form friendships with their teachers. Drop-in yoga classes at most studios and yoga centers are approximately $10, with discounted multiple or unlimited class cards. All-inclusive yoga retreats average $100 per day – with food, accommodation, and yoga classes. Certified 200hr Yoga Teacher Training Courses (YTTC), registered with Yoga Alliance, range in tuition between $2000-$2500 – including food and accommodation for $4000-$4500 – both in Ubud and Sri Thanu. So, with little difference in price and quality, the choice between yoga on Koh Phangan or Bali is more about the surrounding environment. Travelers can choose the hustle and bustle of famed Ubud, or the unflustered coziness of Srithanu – similar to the beloved Bali of the past, before the spiritual tourist boom. Traveling to Thailand, and extending your stay, is much easier for tourists than in Indonesia. Staying in either country for up to 30 days is free for citizens of many countries, and the price is comparable to extend your stay up to 60 days, but the visa extension process is much less time-consuming and more straightforward in Thailand. As of March 2016, there are now 169 countries that receive a 30-day free visa upon arrival in Indonesia, but it’s non-extendable. So, if you want to stay up to 60 days, you have to pay US$35 for a visa on arrival (67 countries) and extend it for $35 – totaling $70 to travel for two months – but the extension process is complicated unless you pay extra for a visa agent to manage it for you. Tourists can apply for a visa in advance to receive a 60-day visitor visa from their home country, or from a country close to Indonesia. It is also possible to manage a 60-day social visa through an agent for around US$150 – flying roundtrip from Indonesia to Singapore or Kuala Lumpur, Malaysia to extend your stay for another two months. The official overstay penalty is approximately $23 per day. Additionally, when leaving Indonesia, there used to be an airport tax or passenger service charge for international flights, but as of Feb 2015, this should be included in the ticket price of international flights. Without applying for a tourist visa in advance, citizens of 62 countries can enter and exit Thailand for free, and most nationalities receive a visa exemption, receiving 30 days upon arrival by air, and 15-30 days by land. If you decide to stay longer than one month, a visa extension costs approximately US$55 for another 30 days in the Kingdom of Thailand. If you are staying on Koh Phangan, you can travel by ferry to the immigration office on the neighboring island of Koh Samui to extend your visa. If you include the cost of a roundtrip ferry ticket and motorbike taxi from the pier to the immigration office, your 30-day extension totals around $70, which is the same as in Indonesia. However, the process is much more simple, and only takes half a day to go and return. Another option is to cross a land border to receive another 15-30 days, or fly in and out of the country for another free month. Many people who decide to stay longer than two months go to Malaysia, Laos, or Myanmar (Burma) to get a 60-day tourist visa for Thailand (which can be extended once for another 30 days). Some countries even issue multiple-entry tourist visas which can be stretched to last up to a six-months in Thailand. But the Thai government is cracking down on “visa runners” who have several stamps or tourist visas back-to-back in their passport. If you overstay your visa, the penalty is around $15 per day, which is less expensive in Thailand than Indonesia. But all in all, the process of staying longer in Thailand is much more stress-free and relaxed, which is why so many people choose to extend their stay in this magical Kingdom. So, the choice is yours, but when comparing tropical island travel destinations in Southeast Asia – especially for a healing or healthy holiday which involves yoga practice or study – consider Koh Phangan (Thailand) instead of Bali (Indonesia). 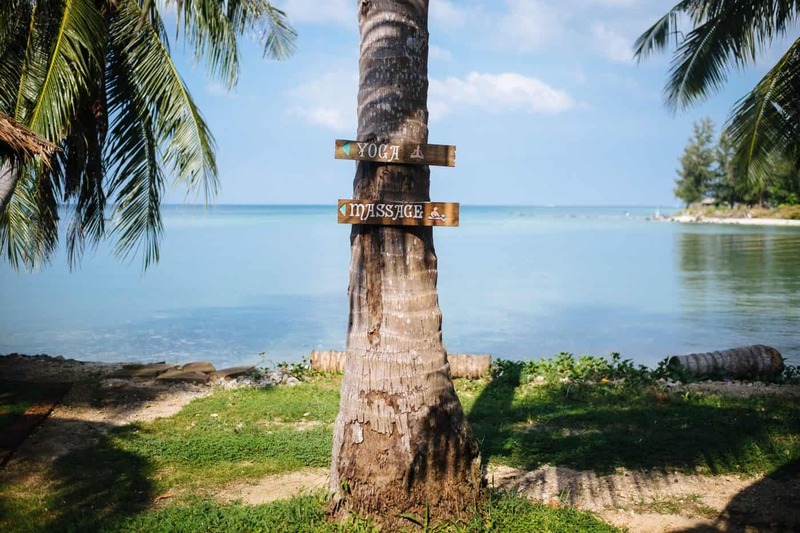 The village of Sri Thanu on Koh Phangan is a blossoming conscious community where spiritual seekers can meet like-minded individuals who value the quiet, relaxed island lifestyle, pre-development and over-commercialization. If this resonates with you, start planning your yoga holiday on Koh Phangan today!